I have been a great believer in the 'never-skip-breakfast' theory. The credit for this goes to my mum, who made sure that my sister and me had our breakfast before setting out for school, college or work. Although, I personally prefer the Indian variety like chappati, upma or dosa; the continental variety like ham, sausage etc. is eaten with equal élan. The only thing is that it should be piping hot and accompanied by an equally hot cup of tea. That's all that is required to get my day started. Among the Indian breakfast variety, upma is the most preferred. Upma is primarily a sort a savory made from semolina (rava), onions, peas and seasoned with coconut. The sweeter version of the upma is called Sheera. 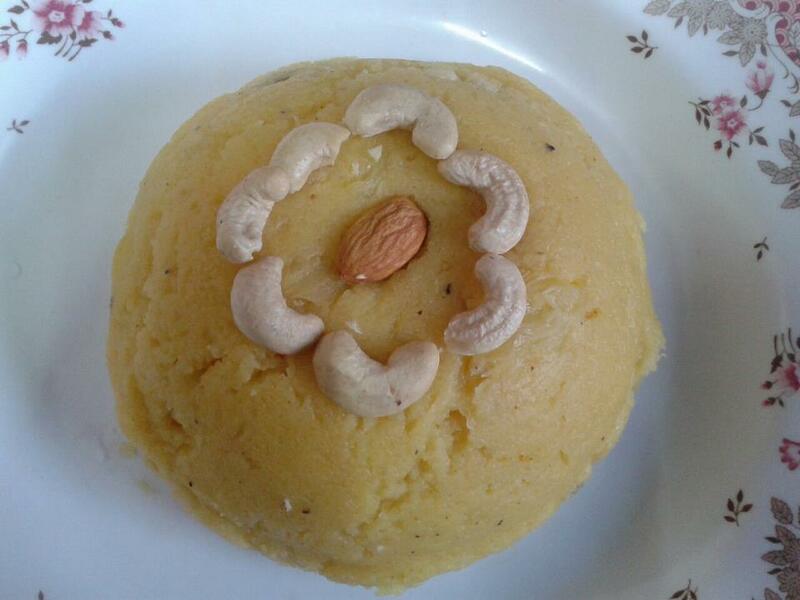 This is usually made with ghee and generously seasoned with dry fruits. 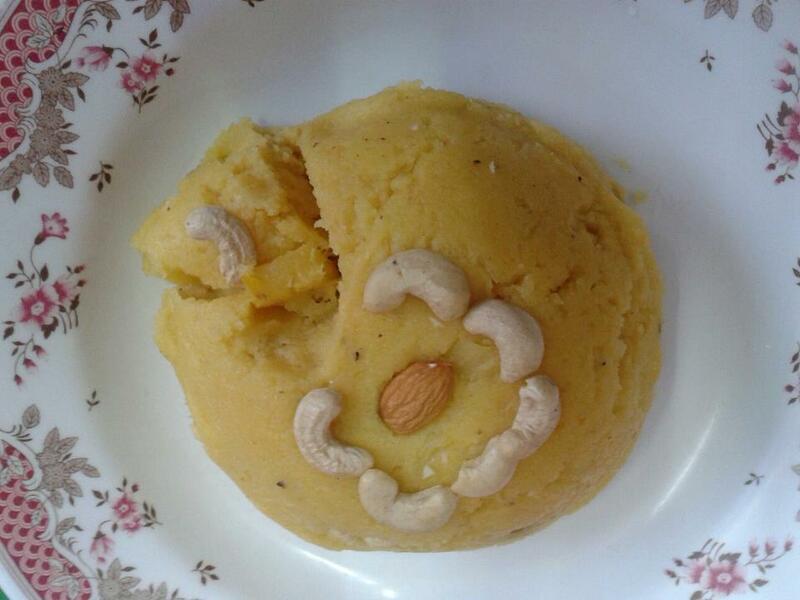 Another version of the Sheera is the “Pineapple Sheera”, which makes it to the blog today. This recipe was actually made by my sister (who by the way has a whole set of sweet teeth). Though personally, I am not a sweets person, I particularly liked this version since it contained my favorite fruit the pineapple. This is one sweet that I didn’t mind taking 3 servings; drop in a few dry fruits and you have a combination that is quick, easy and liked by everyone. I'm sure you wouldn't want to wait to try this one. Here's the recipe. In a non-stick pan, heat butter; add the pineapple puree and the pineapple pieces. Let this cook for a while. Then add some sugar and mix well. Keep aside and allow cooling. In another pan, add the ghee & roast the nuts. Now take out the nuts and add semolina. Cook till the semolina has turned brown. Once it turns brown add the milk and hot water. Cook till the semolina has absorbed the milk and water. Add the sugar and stir. Now, add the pineapple puree and pieces while reducing the flame to low. Lastly, add the pineapple essence and cardamom powder the roasted nuts and stir well. Serve hot with a cup of coffee. · Clean the pineapple and chop the flesh roughly discard the center portion of the pineapple. · Grind this to a fine puree in the mixer and add a teaspoon of sugar for that bit of glaze. We add sugar to the puree when cooking so that just incase the pineapple is sour; the sugar coats it renders it sweet.